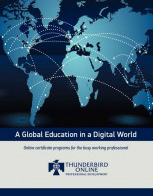 Thunderbird Online's Global Partner Network is designed to work with organizations around the globe to develop top-ranked Thunderbird content, and deliver content to individuals within their organizations and around the world. We focus on creating and delivering innovative online learning content and programs that you require as a busy professional in today’s competitive global marketplace. Strategic Partners work directly with Thunderbird Online to enhance your online learning experience and facilitate global access to Thunderbird Online's top-ranked content. Affiliate Partners promote Thunderbird Online professional development and continuing education programs to their member base and enable easy access to Thunderbird Online’s material. Corporate partners have chosen to work with Thunderbird Online to bring top-ranked Thunderbird content to their organization either through the existing certificate programs or custom created programs. Corporate partners typically have groups of 3 or more participating in a Thunderbird Online course, and offer Thunderbird Online programs to groups as large training programs or through their corporate training department. For more information contact your Thunderbird Client Relationship Specialist today.